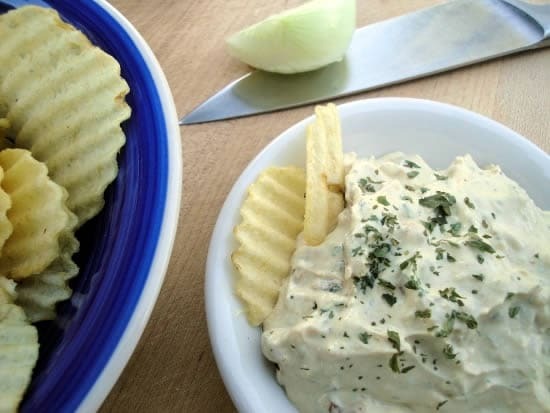 This homemade dip is a delicious replacement for the instant packages of junk. Trust in this dip, it’s the real thing! Which of these ingredients from this box of processed “food” do you have in your kitchen? onions, salt, cornstarch, sugar, caramel (color), corn syrup solids, yeast extract, natural flavor. 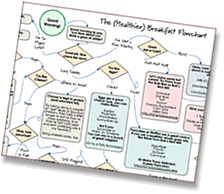 If you have an average home kitchen, you probably have the first four on hand and wonder what exactly the last four mean (and are they really food?). When cooking “unprocessed,” many of your favorite recipes may have to go by the wayside because they use a processed food (Kraft Foods and Campbell’s cream of soups are famous for their delicious and easy recipes, right?). My goal today is to help you “unprocess” those recipes that use ingredients that are already found in a box or a can. I find that when I’m trying to reverse engineer something, it’s an exercise in common sense most of the time. Working from those Q&As, I kept it simple. Using real onions almost exclusively really does do a pretty good job of replacing onion soup mix when used in beef recipes. I use lots of onions and cook them well, and the caramelizing adds the flavor that is perhaps lost with the chemically enhanced ingredients. Other than that, a generous dash of salt and a bit of molasses (which I like in savory dishes in small amounts) completed the meal without any additional seasoning. When I’m feeling more creative, I might try adding other spices such as fresh garlic, parsley, and other herbs I know we like. It might not be exactly the same as the old favorite, but sometimes it even gets better. Read the ingredients on the packaged food you’re trying to avoid. Ignore all the words you don’t understand. For real. They’re not in your kitchen anyway. Figure out the main body – is it a liquid oil, a creamy base, dried vegetables, or what? Use olive oil or melted butter or coconut oil for liquids, homemade “cream of” soup or yogurt/sour cream for creamy stuff, and the real thing for dried veggies (as a general rule). What spices are going on? Take your best guess at what would taste good in the dish if you’re not sure. Corn syrup, High fructose corn syrup, or any other ingredient that ends in “-ose” are just sweeteners. Generally they’re included to enhance flavor, mask the lack of taste, replace some deleted fats, or as a preservative. The only time you need to bother adding sweetener back in is in the first instance. Many say tomatoes are enhanced by a teaspoon of sugar (try molasses! ), for example. Don’t be afraid to fail. Most of the time, you get to taste what you’re making before you serve it. That’s the beauty of cooking over baking – you can add ingredients right up until the end and no one will know. It’s definitely an art, not a science. When I told Andrew I wanted to share a reverse engineered onion soup mix, he immediately rejoiced in the fact that he might be able to have a real food version of that chip dip made with sour cream and a packet of onion soup mix. I could practically hear him jumping up and down through the computer screen text. How could I tell him that I had no idea how to do that and had only used onions to make pot roast and pepper steak that tasted pretty good? I couldn’t break his unprocessed heart, so I gave it the old college try with three different versions. And the verdict from my college sweetheart (aka the Husband)? He says if he had this dip and “the real thing” (meaning from the store) to choose from, or even the second best attempt, he’d choose the homemade version. And he’ll tell you without batting an eye that there are plenty of packaged things he’d choose over my “real food” versions, so don’t think he’s just being romantic. This homemade dip is a delicious replacement for the instant package items able to be purchased at the store, trust in this dip, it's the real thing. Inspired by Ina Garten's recipe and Mandi's homemade onion soup mix from Easy. Homemade. Melt the butter in a heavy pan, then saute the onions over medium for a few minutes, stirring constantly. Turn the heat to medium-low for about 20-30 minutes. Stir occasionally and cook until browned and smelling amazing. The onions will have reduced to about 1/3 cup. Allow to cool, but not in the refrigerator (the butter will harden too much). Mix with the sour cream and all the spices. Allow at least an hour for the flavors to blend, and serve at room temperature if possible. SKIM MILK, WHEY (MILK), PALM OIL, WATER, CONTAINS LESS THAN 2% OF ONION*, PARSLEY*, SALT, SUGAR, HYDROLYZED SOY AND CORN PROTEIN, HYDROLYZED TORULA AND BREWER’S YEAST PROTEIN, CITRIC ACID, LACTIC ACID, ACETIC ACID, MONOSODIUM GLUTAMATE, FOOD STARCH-MODIFIED, GELATIN, SODIUM HEXAMETAPHOSPHATE, LOCUST BEAN GUM, SOY LECITHIN, POTASSIUM SORBATE (TO PRESERVE FRESHNESS), GUAR GUM, CARRAGEENAN, YELLOW 5 & 6. *DEHYDRATED. If you ask me, that’s 7 actual foods plus 18 chemicals, non-foods, and food-like products. I’ll take my 9 whole foods ingredients any day. The terrible irony of this post is that in order to test the chip dip, I bought a bag of chips. Probably the first bag I’ve purchased in a year (hmmm, maybe that’s why the husband was so agreeable to the dip!). 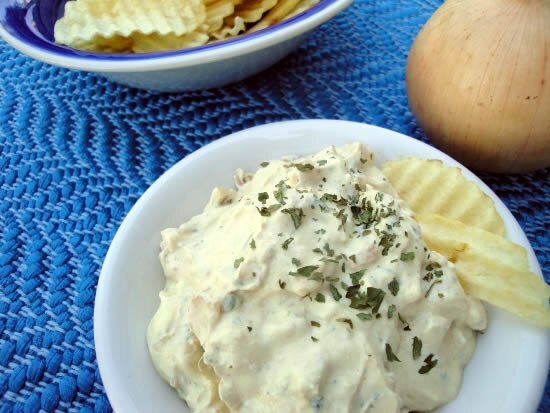 If you make this chip dip during October #unprocessed, you’re going to need to make homemade potato chips, too. But (crunch)…it will be worth it. Fantastic. Thanks for the advice to just ignore all the ingredients that you don’t recognise – they are not foods anyway! Thank you, Katie!! I had given up on dips in general because of my allergy to MSG. I can’t wait to try this and will look forward to you new ebook. 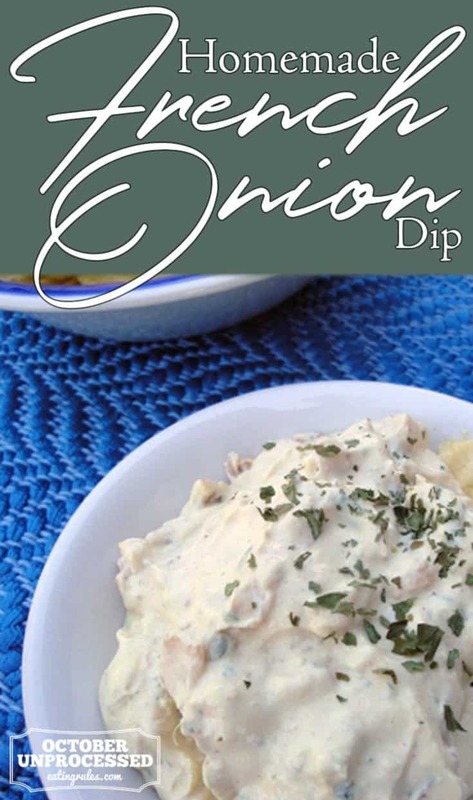 There are so many good dip recipes out there – I do another one with yogurt cheese (or sour cream), fresh garlic, some spices, and lemon juice. Super simple, so yummy on veggies! I will HAVE to try this! My boyfriend’s family is obsessed with French Onion dip and it’s there every single time I go over to his parents. I’m excited to try this out and hopefully convert them!